Don’t you wish that every time you post to your blog, a link to the post, thumbnail image, and description would automatically appear on your Facebook Timeline or within an app on your Page? Well, that is the purpose of NetworkedBlogs, a Facebook app that gives you the ability to host your blog’s RSS feed on your Facebook Timeline. When you publish NetworkedBlogs as a tab on your Facebook Page, your blog updates don’t appear on your Timeline; they appear in a Blog tab. 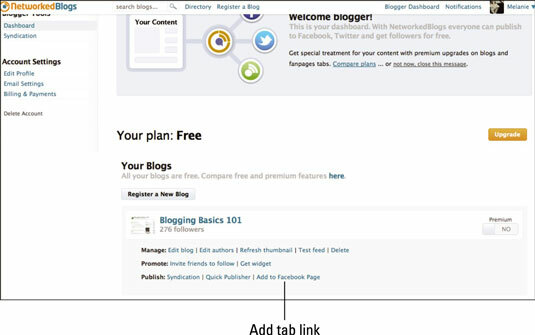 You direct your fans to the NetworkedBlogs tab on your Page by including the URL for the tab in updates. 1Go to your NetworkedBlogs dashboard and click the Add to Facebook Page link. The Add Page Tab dialog box appears. 2Use the pull-down menu to choose which Page you want your blog updates to feed to and then click the Add Page Tab button. You return to your NetworkedBlogs dashboard. Beneath the blog info, you see a list of the Page(s) you added to your blog feed. 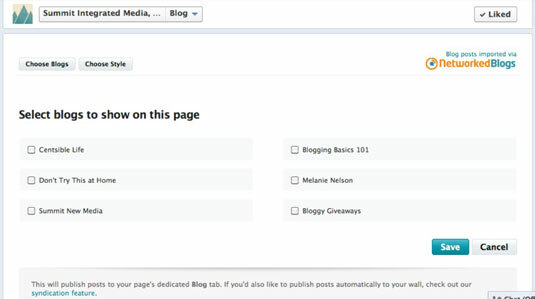 You can repeat this step to install your blog feed on multiple Pages. 3Select the Click to Edit link for the Page where you installed the tab. You’re taken to the canvas page for the NetworkedBlogs app on that page. 4Click the Choose Blogs button at the top of the page. A new page appears showing all the blogs you installed or claimed. It’s okay if you only see one blog — that may be all you’ve installed or claimed so far. 5Select the check box next to the blog(s) you want to feed through your Page and click Save. 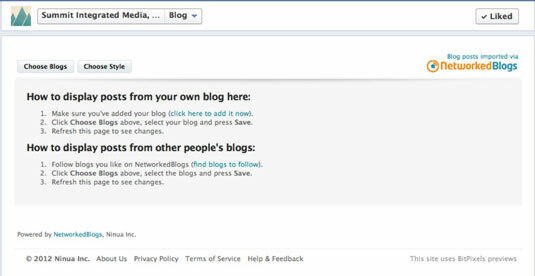 New blog posts will appear in the NetworkedBlogs tab on your Page (they will not show up on your Timeline).